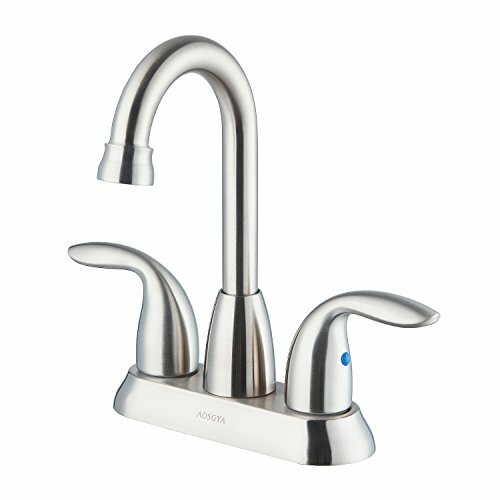 AOSGYA provides quality guaranteed bathroom faucets. Ideal cost effective choice for both bathroom and commercial sink faucet replacement. AOSGYA cares for your water drinking and use safety. All our faucets complies with US standard, with cUPC, NSF61-9 certified, which means the faucet you buy from AOSGYA is lead-free with eco-friendly materials. Drip Free Ceramic Cartridge: High seal ceramic cartridge for reliable drip-free performance(At least 500,000 times' life cycle test). High Performance Neoperl Aerator: Neoperl aerator,provides a splash-free stream, well aerated and soft to touch,easy to clean. Healthy Lead-Free Waterway: Constructed with lead-free material and top-quality components, which protect your health. The finish colors represented on the website may differ slightly from the actual product and different monitors may cause colors to vary slightly. We recommend customers contact us before buying if needed. If you have any questions about this product by AOSGYA, contact us by completing and submitting the form below. If you are looking for a specif part number, please include it with your message.